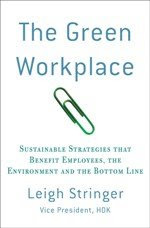 The Green Workplace: Is Your City REALLY Recycling? 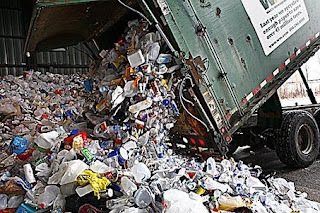 I just read an article in Washington, D.C.'s local CityPaper this week about how a good portion of our city's recycled trash is picked up and co-mingled with the regular trash. In 1988, the city set a goal of recycling 45 percent of its trash by 2004. The city is only recyling 24 percent now. And based on what CityPaper reporters have witnessed, the recycling level is likely much less than that. Apparently San Francisco, Seattle and Dallas recycle around 50 percent of their trash, so D.C. is far behind. Garbage crew members say they are running behind schedule and under orders from supervisors to just get the trash off the streets. Apparently citzens complain more about getting garbage off the streets than they do about the co-mingling of non-recycled and recycled garbage. Some regular garbage crews said they were "helping out" the recycling garbage crews who could not handle all of their stops around town. Recycling prices have plummeted, so the city's 40 companies registered to haul away recycling from commercial buildings have lost an incentive to recycle to the extent they did a year ago. The city awarded a Maryland company the contract of processing all of D.C.'s recyclables. This increased the costs for garbage trucks to collect and deposit the garbage (longer distances to drive) which put an unnecessary burden on smaller recycling garbage collectors. D.C. is pretty good about enforcing some recycling enfractions, but not the hauling of recycling to the city dump. As someone who trys to religiously recycle at home and at the office, it's extremely frustrating to think of my hard work going to waste (pun intended). But there are clearly incentives that need to be adjusted for all parties to work well in this recycling system. If you feel the same, let D.C. administrators know!